You spend a lot of time focused on your loved one’s care. From helping them get to their doctor and therapist appointments to making sure they are fed and clothed to giving them unconditional love and attention, much of your day goes towards their needs. As much as you love them, this is a difficult weight to carry, and it can be hard to be the sole provider. Regardless of the particular health condition or disability, healthcare requires a certain level of attention to detail that is difficult to maintain while also balancing your work and the other important people in your life. It can sometimes feel like all of your time is dedicated solely to your loved one’s care, which may make you feel frustrated, overwhelmed, resentful, and isolated. If additional extended care is needed to tend to your loved one due to an illness, injury, or disability, you don’t have to walk this journey alone. Many others have taken this path before you, and we have helped them along the way here at Evergreen Home Healthcare. 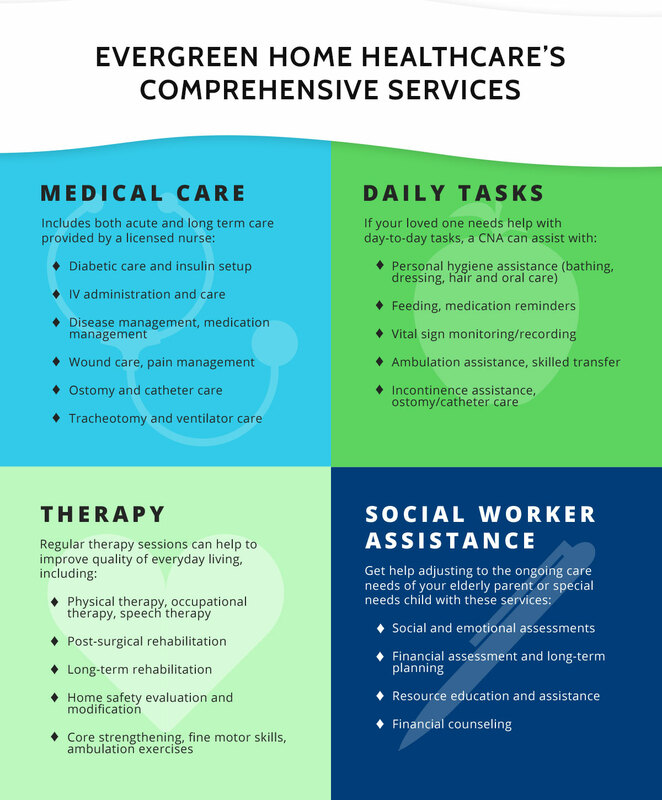 If you are looking for compassionate adult or pediatric home healthcare in Greeley, we are prepared to help you connect with the in-home healthcare and other resources you need to offer your loved one the highest quality care. What Does Home Healthcare Look Like? In-home healthcare isn’t one-size-fits-all. The care your loved one needs will be different from the needs of other clients. That is why we have composed our staff of a variety of healthcare professionals who can address many different concerns. From certified nursing assistants (CNAs) to nurse practitioners, we have a variety of nursing professionals on staff to ensure that your loved one can access the medical care they require. That being said, we know that care doesn’t end with medical concerns. That is why we also have a staff of other healthcare professionals, including physical and occupational therapists and clinical social workers. At our home healthcare agency, we have a staff who can help your loved one whether they are a child or an adult and regardless of their specific health concern. We will start where care should always begin: with a personalized plan. For some, this means that we will send a physical therapist to your home three times a week; for others, this may mean an in-home nurse provides round-the-clock medical care. We will work with your loved one’s primary care provider to determine what level of care is most appropriate. We also offer home evaluations and can you help identify areas you can adapt to make daily living easier for your loved one. We are also more than happy to help you with a financial assessment and connect you with resources in the Greeley community that can ease the burden of care. Whatever questions you have, we will do everything we can to connect you with the answers you need. We are dedicated to making your life easier and providing your loved one with the highest level of care. Does My Loved One Need In-Home Health Care? For some, the answer to this question will be obvious. If your loved one requires round-the-clock care, a home health aide offers a clear solution to allow them to live in the comfort of your home instead of staying in a hospital long-term. However, like most of life, home healthcare can be a gray area. For example, if your current plan of care involves taking your loved one to physical therapy several times a week, in-home healthcare may not seem necessary. With our staff of a variety of healthcare professionals, there are many different ways we can provide care for your loved one. If you are curious whether or not your loved one could benefit from our services, consult the chart below. At our home healthcare agency in Greeley, our goal is to provide you with in-home health care that creates balance in your life. You want to give your loved one everything that need to have the highest quality of life as possible, but without professional help, this can be to the sacrifice of your own autonomy and happiness. Allowing you to provide to give the excellent care you want while still living your best life, in-home health care is advantageous for many. We can bring medical care, therapy, and even more resources into your home for a more convenient and effective method of care. Right now, escorting your loved one to their various appointments around Greeley eats up a lot of your time. With our in-home health care services, you can save hours of your time because we will bring medical care to you. With fully trained, compassionate nurses on staff, we can offer a variety of medical services in your home, including medication/injection administration, IV administration, wound care, and more. Instead of having your loved one stuck in the hospital for days or having to go back and forth to receive the care they need, you can both feel more relaxed and comfortable in your own home. In addition, in long-term care situations, we can help you adapt your home to be more comfortable and safe, educate you on the important care factors, and create a financial plan. We are here to ease the burden of care so you can focus on spending quality time with your family. Working with children offers unique challenges. When you are teaching a child anything, be it multiplication, how to tie their shoes, or the importance of talking about their feelings, it takes patience, empathy, and practice. This is particularly true when you’re working with children with special needs. It can be difficult for special needs children to communicate where they need help, and this can be frustrating as their caregiver because you want to give everything they need. The truth is, special needs children may need additional help, and it isn’t always easy for caregivers to know how and what to provide. This is where a trained pediatric home health aide can offer the relief you need. With extensive experience and training working with children, our pediatric home health aides are prepared to connect your child with their medical needs while helping them learn and grow. Regardless of their specific needs, if your child requires long-term medical care, you may feel quite overwhelmed. You want to help them recover in the most comfortable environment for them, and a hospital is hardly a place most kids want to spend time. That is where a pediatric home health aide provides you with the flexibility your family needs. With in-home health care, your child is able to rest, recuperate, and receive the care they need in the comfort of your own home. Surrounded by their family, beloved toys, and a familiar environment, your child can receive care without spending as much time in the hospital. Save money and time and enhance your child’s quality of life with in-home healthcare. At Evergreen Home Healthcare, we pride ourselves on providing a selection of in-home therapy services that may help your child. Should your child be recovering from an illness or injury, one of our highly skilled physical therapists can come and provide rehabilitation in your home. Alternatively, if your child has special needs that require work with an occupational therapist or speech pathologist, we have qualified professionals on staff who can help you. Regardless of your specific case, we have therapists who can help develop a plan for your child. One of the most overwhelming aspects of caring for a loved one is making a long-term plan. You may be able to get by one day at a time, but that is simply not sufficient when it comes to in-home care—you need a plan for the future. At Evergreen Home Healthcare, we employ several licensed clinical social workers specifically to help you long-term. They can come to your home and help you determine any modifications you may need to make, come up with a financial plan to pay for care, connect you with resources in the Greeley community, and prepare your family for ongoing home care needs. When caring for adults in a home healthcare setting, there are also special considerations to make, particularly when it comes to elder care. For example, it is important to be able to empathize with where an older patient is coming from; while they have spent the majority of their life independent, they now have to rely on others. This can be frustrating as they try to slowly navigate their way through tasks that were once fast and easy for them. No one wants to lose their autonomy, and in patients with dementia, this can be particularly difficult due to memory and mood problems. Working with adults in an in-home healthcare setting requires compassion and patience, which are the two qualities we seek most diligently for in our in-home health aides. Recovering from an illness or injury can be particularly stressful for older adults. As we age, recuperation becomes more of a lengthy process. Instead of spending weeks in the hospital, your loved one can recover in the comfort of your own home with an in-home health aide. If your loved one then requires a therapist of some kind, we can arrange for them to come to your home, minimizing the amount of time you have to spend taking your loved one from hospital to therapist’s office and back. If you are interested in learning how we can help your loved one stay where they really want to be during their recovery, contact Evergreen Home Healthcare. At our home healthcare agency in Greeley, our goal is to provide you with in-home health care that creates balance in your life. You want to give your loved one everything that they need to have the highest quality of life as possible, but without professional help, this can be to the sacrifice of your own autonomy and happiness. Allowing you to provide the excellent care you want while still living your best life, in-home health care is advantageous for many. We can bring medical care, therapy, and even more resources into your home for a more convenient and effective method of care. Right now, escorting your loved one to their various appointments around Greeley eats up a lot of your time. With our in-home health care services, you can save hours of your time because we will bring medical care to you. With fully trained, compassionate nurses on staff, we can offer a variety of medical services in your home, including medication/injection administration, IV administration, wound care, and more. Instead of having your loved one stuck in the hospital for days or having to go back and forth to receive the care they need, you can both feel more relaxed and comfortable in your own home. In addition, in long-term care situations, we can help you adapt your home to be more comfortable and safe, educate you on the important care factors, and create a financial plan. We are here to ease the burden of care so you can focus on spending quality time with your family. Want to Learn More About Our In-Home Healthcare Services? Many people are looking for a more long-term solution to their in-home health care needs. If you are driven by a desire to help others and would like to gain the training necessary to provide medical care to your loved one, consider becoming a certified nursing assistant (CNA). When you train to become a CNA, you can handle many of the medical tasks associated with caring for your loved one, including vital sign monitoring, catheter care, incontinence assistance, and more. Your CNA license enables you to take care of many of the basics of your loved one’s care, reducing your need for an in-home health aide. Plus, once you have been licensed, you can expand your horizons to begin caring for others. We are always looking for qualified individuals to provide home healthcare to our clients. If you are interested in becoming a CNA, contact Evergreen Home Healthcare. Additionally, if you are a licensed nurse or therapist of any level, we are in search of compassionate individuals to join our team. Visit this page to keep an eye on our current job openings. If you have an elderly loved one, you may be quite concerned about allowing them to continue to live in their home. This is particularly true if they have Alzheimer’s or any form of dementia, as it is unsafe for them to live alone. That being said, your loved one likely doesn’t want to give up their autonomy. You may feel like you are stuck between a rock and a hard place, but there is a solution that can make everyone happy: an in-home health aide. When you have in-home healthcare, your loved one can live in an independent way, while still receiving the attentive care they need. Whether your loved one just needs a little conversation or a bit of help around the house, or they require more involved medical care, we have someone on staff who can help. You don’t have to send your elderly loved one to a nursing home; they can stay in the comfort of their home and still receive much needed care. Perhaps the greatest obstacle to quality healthcare in this country is cost. Medical expenses can be completely debilitating to families, and without insurance and a financial plan in place, you may be worrying about how you will pay the medical bills for years. At Evergreen Home Healthcare, we are happy to take a look into your insurance plan and help you determine the best course of action for your loved one and your finances. Whatever your particular area of concern, we would love to help you ease the burden of care. Regardless of how you might feel, you aren’t alone. Many families in the Greeley area are going through similar experiences with their loved ones, and while no two cases are the same, you can certainly find many people who can relate to how you are feeling. It may help you to cope with stress if you can connect with others in the form of a support group or other local resource. Both in the local area and on a national level, there are services you can connect with through one of our licensed clinical social workers. We also offer financial resources to families. Visit our Resources page to start connecting today. At Evergreen Home Healthcare, we are always looking for caring in-home healthcare aides. We offer CNAs, LPNs, RNs, and Nurse Practitioners positions on our team, as well as licensed clinical social workers and physical and occupational therapists. If you are a healthcare professional who is looking for a rewarding way to use your valuable skills, in-home healthcare through Evergreen Home Healthcare is an excellent option. We are actively seeking compassionate caregivers to join our team all over Colorado, including in Greeley. If you are looking for a flexible career in in-home healthcare, check out our current Employment opportunities.